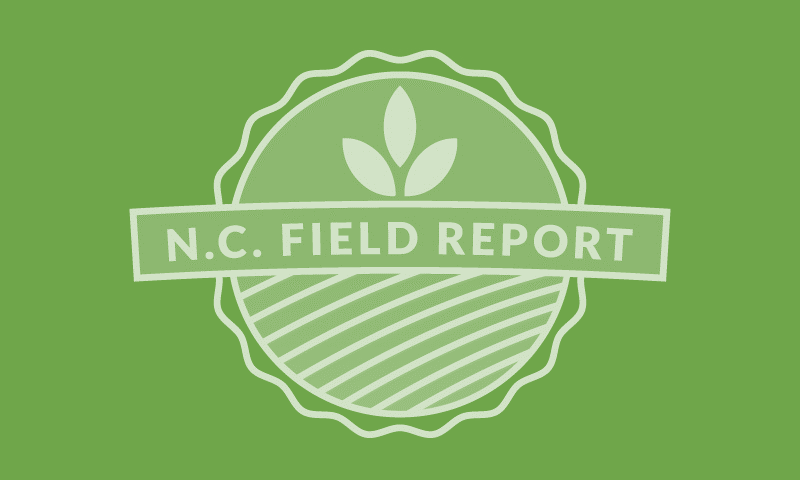 With the unpredictable threat of tropical weather and the pressures of harvesting large acreage, the question of whether or not to use chemical application to hasten maturity often arises in N.C. soybean production. Several factors need to be considered when deciding whether the application of a harvest aid makes sense, including avoiding grain loss due to shattering or seed quality decline, pre- harvest intervals associated with chemical application, harvestability due to green stem and proper application timing. With funding from the checkoff, a study was conducted across five North Carolina locations to determine the influence of harvest aid application and harvest timing on soybean yield. Two herbicides, Gramoxone (paraquat) and Sharpen (saflufenacil) were applied at labeled rates and timings. Soybeans were harvested at 7 to 10 (Harvest 1) and 17 to 20 (Harvest 2) days after application. These desiccants were applied when 70% of the seeds had reached physiological maturity. An untreated check was harvested at the standard commercial harvest time. The only treatment that resulted in a significant yield loss when compared to the untreated control at -4.1 bu/ac was harvesting 17 to 20 days after application of Gramoxone. Overall, soybean yields were better at Harvest 1 with either product. 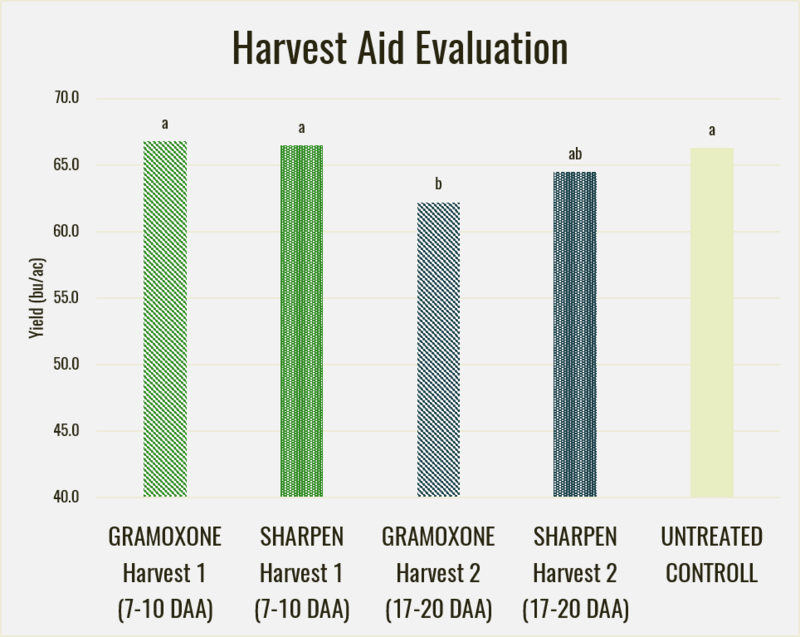 Application of Gramoxone resulted in lower green stem levels at both harvest intervals compared to Sharpen. 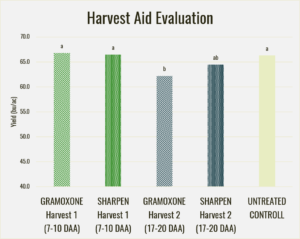 Yields following Sharpen at both harvest timings were not significantly different, however green stem ratings were higher at Harvest 1 and Harvest 2 compared with plots treated with Gramoxone, indicating it takes more time for plots treated with Sharpen to reach optimal harvestability. These results demonstrate the use of harvest aid products for desiccation can expedite harvest in a way that allows farmers to achieve optimal yields at adequate moisture while harvesting their crop substantially earlier. In this study, yields equal to the untreated check were attained while harvesting 14-24 days ahead of a normal harvest time, which could be the difference in avoiding a devastating weather event. Although Gramoxone performed best in this study when applied seven to 10 days before harvest, the NCSPA supports following the 15-day PHI mandated by the label.